A combination of evolving dietary patterns to reduce obesity and significant shift in consumption preferences has been studied in the report, which is responsible for spurring the adoption of high intensity artificial sweetener. The report also outlines the growing adoption of high intensity sweetener in case of oral care products, owing to its ‘non-cariogenic’ nature i.e. it doesn’t cause cavities. In North America and Europe, the consumption of soft drinks, which is a major end user application for high intensity artificial sweetener market, is declining by a considerable rate. Significant alterations in consumer sentiments and preferences are one of the major reasons for the population in Western Europe and North America to gradually give up on soft drinks consumption. Consequently, the demand for artificial sweetener is also witnessing a downturn in these regions. However, the demand for high intensity artificial sweetener remains strong and robust in APEJ, with increased consumption of products using specific quantities of specialty sweeteners. Moreover, Middle East and Africa maintains a promising growth in the high intensity artificial sweetener market at an impressive CAGR. 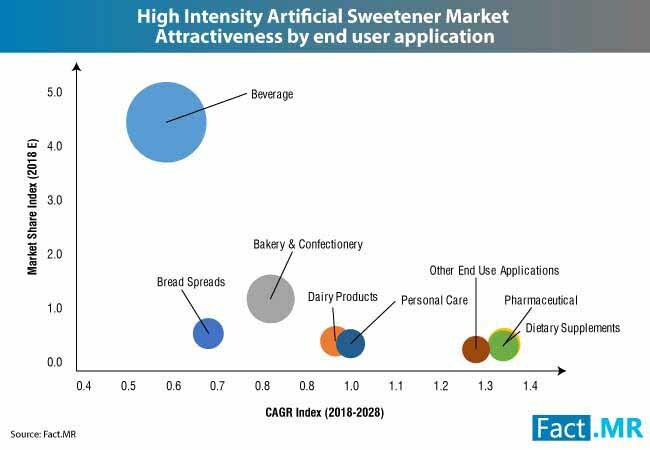 With health and wellness concerns swelling at a meteoric pace in the region in the light of upswing in obesity rates, a broad category of health enthusiasts is encouraging an influx of new and effective products in the high intensity artificial sweetener market space. The report has also identified the adoption of artificial sweetener to be impacted by specific regulations on sugar intake. National as well local governments are imposing sugar tax and levies, as a part of their attempts to fight obesity, which are likely to bode well for the market growth. As per the research study, the penetration of high intensity artificial sweetener amid the deep-rooted influence of refined sugar is likely to be challenging and is solely dependent on the performance parameters. The Fact.MR research study outlines the growth of high intensity artificial sweetener market for the period of 2018-2027. As per the report, the market is likely to expand at a CAGR of 3% over the forecast timeline.